Grethe was born and raised in Provo, Utah. She received her BA from Brigham Young University, graduated from the Management Training Program at Radcliffe College, and has studied at Southern Connecticut State College, Harvard University and the University of Utah. While living in Boston from 1967-1978, she was managing editor of Exponent II, a newspaper devoted to women’s issues, served as a member of the planning committee to reorganize the Harvard Faculty Women’s Club and was a board member of the Cambridge Family and Children’s Services. 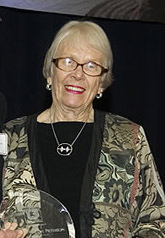 Upon her return to Utah she served as a member and Chair of the Utah Endowment for the Humanities; she was instrumental in organizing Women Concerned About Nuclear War; was a member of The Young Women’s General Board of the LDS Church, served as an organizing member of the State Task Force on Sexual Abuse and was instrumental in creating the Children’s Justice Centers of which there are now 14 statewide. She served as a member of the Board of Trustees of the Salt Lake Olympic Committee. She has recently retired as Director of the Tanner Lecture on Human Values after serving in this capacity for over 20 years. She is presently an outside Director of Wright Express Financial Services Corporation which is an industrial bank serving the Wright Express Corporation of Portland , Maine.